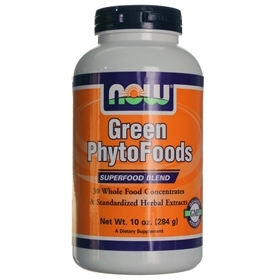 Green Phyto Foods - 10 oz. Green plants (phytonutrient-rich products derived from green plants, algae and cereal grasses) provide us with one of nature’s most vitamin-blessed sources of full-spectrum nourishment. With their exceedingly high concentrations of chlorophyll, vitamins, minerals amino acids, enzymes and plant sterols, these seasonally harvested super-foods are abundant in a wealth of immune boosting, energy producing nutrients. Available in both powder and tablet form, NOW Green Phytofoods can serve as a welcome addition to any healthy lifestyle. Green Phyto Foods is a nutrient dense collection of superfoods. There is a green blend that include spirulina, alfalfa, chlorella, wheat grass, and barley grass, for cleansing, detoxifing, chelating heavy metals, and providing a rich source of chlorophyll. There is a blend of soluable and insoluable fibers, for regularity and lowering cholesterol levels. It contains antioxidants like COQ10 and alpha lipoic acid. This powerful blend is loaded with vitamins, minerals, trace minerals, phytonutrients, adaptogenic herbs, and much more. Start off your day with a burst of nutrients and energy. Spirulina is green in nature, and hence it contains a significant amount of phycocyanin and chlorophyll, the latter absorbs energy from the sun to manufacture carbohtdrates which boosts your energy. Spirulina is a powerful antioxidant, and due to it's highly nutitious profile, many people that consume it are able to lose weight. One of the most vital spirulina benefits, which were proven by research, is that it can aid in fighting cancer and any viral illnesses. It is also been shown to enhance a person’s immune system, and help in increasing the libido level of individuals. Chlorella is a green single-celled micro algae that contains the highest concentrations of chlorophyll known (60mg/serving). Chlorella supplies high levels of Beta-Carotene, Vitamin B-12, Iron, RNA, DNA and Protein. The cell wall in this high quality Chlorella has been broken down mechanically to aid digestibility. Chlorella will bind to lingering heavy metals, chemicals and pesticides found in your digestive tract, which is your body's pathway to your bloodstream where these harmful toxins are delivered and deposited into your body's cells. So chlorella first and foremost will help your body eliminate unwanted metals and toxins. Wheat Grass literally floods the body with therapeutic dosages of vitamins, minerals, antioxidants, enzymes, and phytonutrients, and is also a powerful detoxifier, especially of the liver and blood. It neutralizes toxins and environmental pollutants in the body, due to beneficial enzymes that help protect us from carcinogens. Suggested Use: As a dietary supplement, mix or blend 1 heaping tablespoon into 8 ounces of juice or water. Take 1 to 3 times daily. Other Ingredients: ††Plant based enzyme contains - Protease (12,500 HUT), Amylase (2,500 DU), Lipese (200 LU), Cellulose(500 CMC), Lactase (200 LAC), Papain (6,000 PU), Bromelain (5,000 FCC).